My summer just flew by and I get to meet my new students in about a week. In our district, we have "Meet the Teacher" Day on the Friday before school starts. It's an exciting day for both teachers and families! Families can come into the classroom to meet their child's new teacher in the afternoon. It's an informal meeting and my new students and their parents will drop in at any point during that hour. Usually, previous students like to drop by and say hello too! New students, new parents, previous parents, previous students adds up to a lot of potential visitors and a hectic but very fun afternoon! I like to use Meet the Teacher Stations to make sure that I don't have a crowd of people in one spot. I have created 5x7 station signs and placed them in acrylic 5x7 frames (I've found that Walmart has the best deal on these here). I spread the stations out around the classroom to get families to circulate and visit all areas of the room. I also like to have a large vase of flowers on my desk,. This year I think that sunflowers in a mason jar would look perfect with my Chalk & Burlap theme! You can find my Meet the Teacher Stations - Chalk & Burlap here. 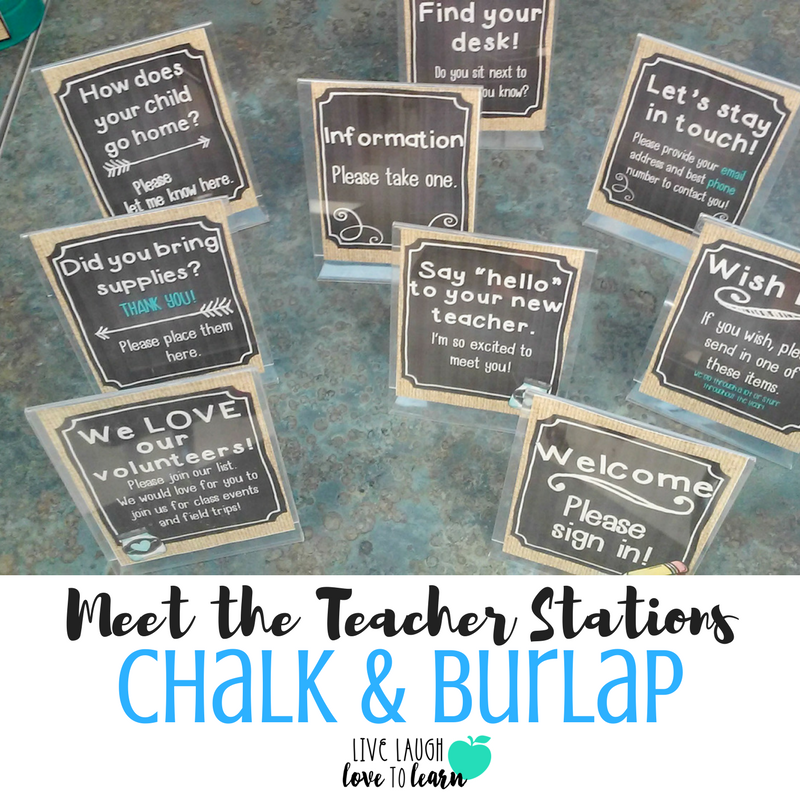 I have several other styles available as well and all of my newest resources are editable so that you can add your own stations!